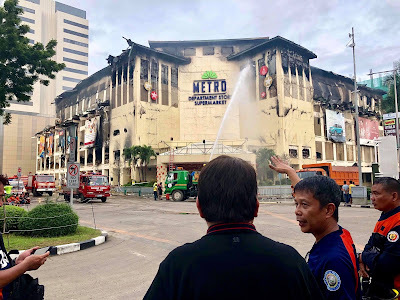 When I saw on Facebook on January 5 that the Metro part of Ayala was on fire, my mind immediately brought me back to 1998 to 2001 when I was a student at the University of the Philippines Cebu. During long breaks between classes, lunch time, or after our Wednesday guidance session, my friends and I would cram ourselves into the Vitara or Civic of one of our friends and ride to Ayala. On days when our designated driver was not around, we would walk to Ayala and would always enter through the Metro. I must have gone through that part of the mall more than hundreds of times and to see it destroyed by fire was quite sad. One of my readers reminded me that though I have already written about the main line of the Gaisano's through an old article on Don Pedro Gotiaoco, I have not written about the Gaisano clan. I realized that as someone whose earliest memories of supermarkets were at their Gaisano South store in Leon Kilat and later in JS Gaisano in Ilustre in Davao City, it is high time that we explore the Gaisano family tree. Other than warm memories of buying goya milk chocolate or Yan-Yan or Haw Flakes from their stores when I was young, I also remember several cases of fire destroying this and that store of the Gaisanos. One of my earliest memories was a fire eating up my favorite JS Gaisano in Davao in the 80s. I no longer remember when the new store was erected, but rebuild the family did. In 1997 another fire hit the family, this time the White Gold Department store. I remember that this store was a favorite of my grandfather, and that one of my maternal aunts had her wedding reception in the White Gold House restaurant. Again, the family rebuilt and the store has now been relocated to a nearby place. In December of 2011 the five-story Gaisano Capital South in Leon Kilat and Colon caught fire at around 12:40 a.m. Then in January of 2017 another fire hit one of their stores, this time the multi-million building Gaisano Capital in Barangay Mintal, Tugbok District. In the same year, another fire also hit the Gaisano mall in Ormoc City, again starting before dawn. Although there may be some who wish to find connections in these fires, my job is to discuss the genealogy of the Gaisanos, not the investigation into the fires that have devastated their stores over the years. The Gaisano dynasty started with a small, typical Filipina known as an active player in Cebu’s socio-economic activities during her time. She was a well-known philanthropist and was always supportive of the local government. As discussed in my previous article on the Go clan of Cebu, Doña Modesta Singson Gaisano was one of the children of Chinese immigrant Don Pedro Gotiaoco. One of the old stories about Don Pedro was that he left China because he had accidentally killed a relative. Some say that this accidental killing activated a curse that was later to haunt several lines of Don Pedro's descendants. Consider this: aside from various fires destroying various Gaisano department stores through the years, fires have also hit several Robinsons stores, prominent among these were the 2011 fire that hit Robinsons mall in midtown Cebu and in 2013 when another fire hit Robinsons Galleria located in Ortigas Center. This is an interesting connection because the founder of the Robinsons department stores, John Gokongwei, Sr., was a half-brother of Modesta S. Gaisano; both were the children of Don Pedro Gotiaoco. Aside from the Gotiaoco curse, there is also another theory for all these fires. In a study conducted in Singapore, it was discovered that only 13 percent of family businesses in Singapore survive until the third generation; the same study has also been applied to Filipino family businesses which tended to have similar results as their Singaporean counterpart. These similarities in declining family businesses have led to the so-called three-generation curse, which states that the first generation creates the business, the second one maintains it, the third one fritters it away. Unfortunately for this so-called theory, the Gaisano fires happened before and after the third generation began to assume control of the business. For instance, the burning of White Gold and JS Gaisano in Davao happened when the sons of Modesta were still alive, thus it was still the second generation running the business. And the latest fires have happened during the watch of the third and some fourth generation members of the family. Besides, it is clear that the Third Generation curse is far from being applicable to the Gaisanos. The Gaisano family has expanded their supermarket empire into most major cities all over the Philippines. What started as just one supermarket has now grown into an empire. When Modesta S. Gaisano died 1985 her children took over her business and made it the empire that it is today. First, it is clear that the Gaisano name is a maternal name. Modesta Singson Gaisano married Jose Sy Leng Kee, Chinese from Long Hu Ya Kou, Jinjiang in Fujian. Their eleven children: five boys, David, Stephen, Henry, Victor, and John, and six girls, Pian Pian, Kam Kam, Eng Eng, Yan Yan, Ching Ching, and Teng Teng, all used Gaisano as a last name and Sy as a middle name. Although not a rule, many Chinese - Filipino families would use the existing more Filipino last name as a family name and the father's Chinese name as a middle one. The family has maintained its Chinese identity by marrying into almost purely Chinese or Chinese-Filipino families. Even the fourth and fifth generations continue the practice of marrying within the Chinese community. However, here and there, some marry outside the community. For instance, Henry Sia Gaisano II, son of Edmund Gaisano, married Jhezarie Javier, former Bb. Pilipinas-International, while Valeri Gaisano, Henry II's sister, also married a non-Chinese, Glenn Sebastian. Since the passing of Modesta S. Gaisano, the various chains of the Gaisano clan have evolved into the following: Gaisano Capital, owned by the Gaisano Capital Group that was started by Henry Sy Gaisano, Sr. and as of 2010 already has 15 branches all over the Visayas and Mindanao; Gaisano Country Malls, a chain of malls that was started by Stephen Gaisano, Jr., son of Stephen S. Gaisano, Sr.; Gaisano Malls that were started by David Sy Gaisano which also includes White Gold; Gaisano Grand Malls, founded by Benito S. Gaisano, son of Henry S. Gaisano, among others. Aside from malls and supermarkets, the family has also expanded into other businesses like banking. And despite all the issues the family has had to deal with over the years, it cannot be denied that the Gaisanos have helped many throughout the years. For one, their hundreds of stores all over the country have given employment to many, and their generosity in giving scholarship funds to deserving students started 56 years ago continues to this very day. The Gaisano scholarship, which is one of the longest running scholarships in the Philippines, is a project of the Doña Modesta S. Gaisano Foundation established by the children of the Gaisano matriarch in honor of their mother. Every year, 30 outstanding graduates from the different schools and universities in Cebu are awarded P100,000 each as funding for their education. Family curses, while not really logical, add some flavor to family histories. The Kennedys have their own family curse story which just adds more to the tragic events surrounding the deaths of its more charismatic members. Even the Gokongwei's, cousins of the Gaisanos, also have a strange family curse about a half-snake half human member of the family who lurks inside the walls of the Robinsons department stores and abducts female customers. No matter how much the family tries to dispel the rumors, these curses have a life of their own. So, unlike the supposed victims of the Third Generation curse, it does appear that the family is going to go beyond the third generation; in fact, the fourth generation members have now started doing their fair share in running the business.